Whan it comes to quality controllers it's literally all in the touch. 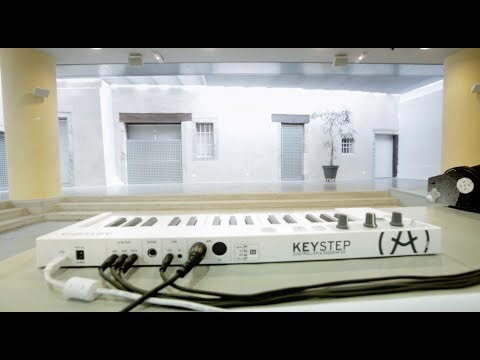 The Arturia Keystep Portable Controller Keyboard has a custom designed slim keyboard coupled with velocity and aftertouch sensors, capacitive touch pitch and modulation controls as well as a great amount of connectivity so that the Keystep is guaranteed to work in perfect harmony with any of your existing electronic music gear. The Arturia Keystep is a small unit that can go absolutely anywhere with you, powered from USB this portable powerhouse gives you the musicality of full-size keys with a tiny footprint. Right from the start you get velocity and aftertouch capability to make your playing extremely expressive. This is coupled up with the touch sensitive ribbons that control pitch bend and the assignable modulation. The Arturia Keystep packs in a new polyphonic step-sequencer with 8 programmable memories and lets you manipulate gate times and swing settings instantly to change the feel of your sequenced performance as you perform. For additional inspiration and performance power the Keystep also packs in an arpeggiator mode and chord play mode so even if you're not best player, the Keystep will help make your recording and performances extremely rewarding. Thanks to the vast amount of connectivity options that come with the Keystep, it's possible to use it with any electronic instrument that supports sync, CV, MIDI and USB connectivity. Got an old synth that you want to bring back into your rig? Simply hook up the Keystep and play your heart out. Arturia are well respected for their high quality gear and the Arturia Keystep Portable Controller Keyboard is certainly no exception, small but tough and powerful, this is one small addition to your rig that will make a big difference to your performance and production capability.